Super Bowl XLVI, hosted in Indianapolis, Indiana. February 5th, 2012. As the big game is just days away, people are gearing up for Sunday and preparing themselves for the largest televised game in all of sports. With an estimated 90-100 million people forecasted to watch, Sunday isn’t a big day just for the Giants and the Patriots; Sunday is the day where the nation’s most popular companies spend up to 10% of their yearly advertising budgets. Projecting an increase in viewership, it is to be expected that an increase in the price of advertising on the nation’s biggest stage, with this year’s price tag for 30 seconds of screen time reaching $3.5 million dollars, an increase from last year’s $3.1 million. Keep in mind that $3.5 million dollars will get you ONE 30-second advertisement, where it will be competing for viewership in an estimated 47 total minutes of commercial time. It’s no surprise that companies like Anheuser-Busch and PepsiCo are willing to shell out nearly a quarter of a billion dollars to run upwards of 10 ads, with some lasting over the 60-second mark. It has also been reported that Swedish company H&M will be airing their first ever Super Bowl advertisement, starring the LA Galaxy and former EPL Soccer star David Beckham. While this isn’t the first time that a global company has advertised during the big game, it is certainly a sign that retailers globally are starting to incorporate the Super Bowl into its scheduling of product launches, as H&M is set to reveal their new line during the ad that will be in stores soon after. It is obvious that while football is an American sport, there is no better way of getting attention during the most watched event of the year. But when it comes down to it, is it really worth it? Many experts agree that, yes it is. It has been reported that nearly 50% of the audience tunes into watch just the commercials alone. The main draw of these commercials isn’t necessarily for people to go out right after and buy the product, but just to stir up some buzz around the company. Being known is always the first step to great sales. However, selling the products helps a lot too. Think about Snickers buying a $3 million dollar ad, and then think about how many candy bars they would have to sell in order to pay for that ad. Don’t worry. Randle D. Raggio, a professor at the University of Richmond in Virginia already did it. You’d have to sell 6,329,406 bars. If 100+ million people see your ad during the commercials though, you probably have a pretty good shot, I’d say. Ready to Play With the Big Kids? Some of the funniest commercials air during the game. Love it. I think that the commercials during the Super Bowl have a huge effect on consumers. I was with a lot of people watching the Super Bowl so it was hard to hear many of the commercials. One of the commercials I vividly remembered was the H&M add, which was probably because I’m a girl and think David Beckum is attractive. However H&M was smart in targeting young women because I have already been on shopping on H&M’s website due to that commercial. The commercial also focused more on the visual aspect than what was said, which was more effective for me because I could barely hear any of the commercials anyways. You bring up a good point! Many people often get together with friends to watch the game, and H&M was aware of this. Their commercials normally run with just music playing in the background with the main focus being the images on the screen. This was a commercial you didn’t have to hear to notice, and in that way, it was a success for them! It is amazing how much money is spent on advertising these days. 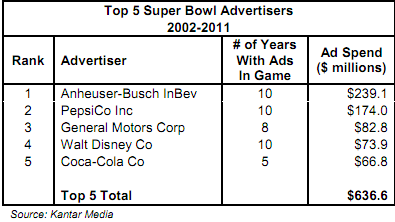 I am sure some Super Bowl advertising is effective, especially for larger companies with a larger demographic. However, I wonder if there are any stats focused on smaller companies “betting it all” on the hope of landing a solid customer base through the Super Bowl. This would be an incredible incentive for many small companies to advertise if the stats showed a successful return on investment. In fact, if Super Bowl ads worked for small companies or start-ups it would be an integral tool in raising venture capital for the business.